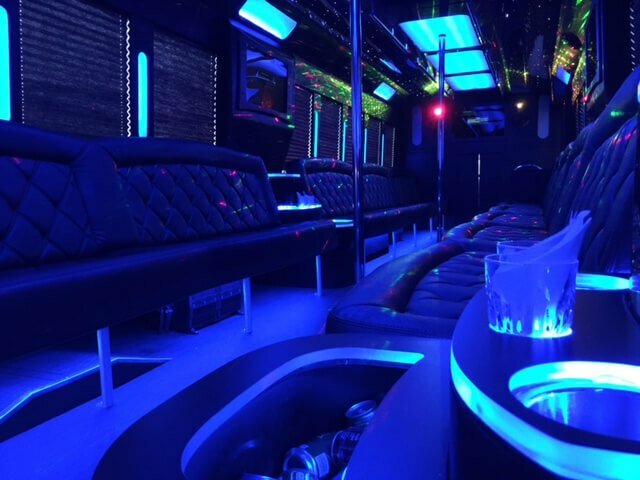 Whether you’re planning a wedding, corporate event, birthday, bachelor party, or just a night on the town in Las Vegas, you want to travel in a stylish party bus. The transportation you select sets the tone for the entire night. Get it right, and you’re priming your group to have an unforgettable night. Get it wrong, well, that could spell disaster. How much is it worth to my group to arrive in style, have plenty of room, and be surrounded by luxury as we travel? Your transportation should be a pleasure, a bragging point, not something that must be endured and suffered through, right? Imagine your party pictures standing in front of one of the beautiful vehicles below. Think of the shares you’ll get! 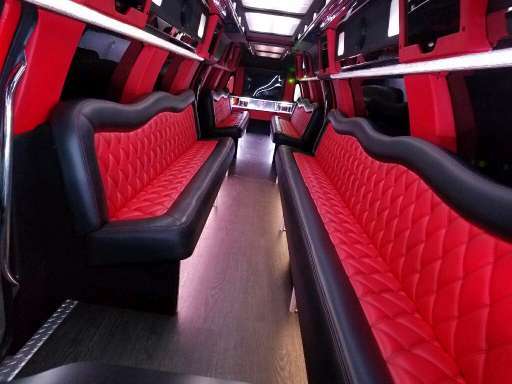 The good news is if you do a little research and planning, you can rent an amazing party bus, fully decked out, for not much more money than cramming everyone into cabs or rideshares. Suppose you have 25 people that you need to move around for a birthday party. 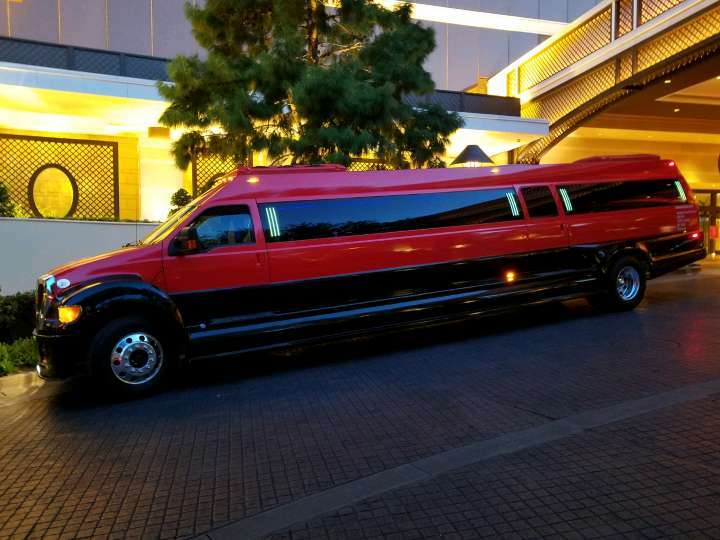 Even the most expensive party bus costs $300 for a pickup at your hotel, and drop at the venue of your choice on the strip. So to move all your people, in style, both ways is $24 per person. Drinks cost more than that at most bars and clubs in Las Vegas! 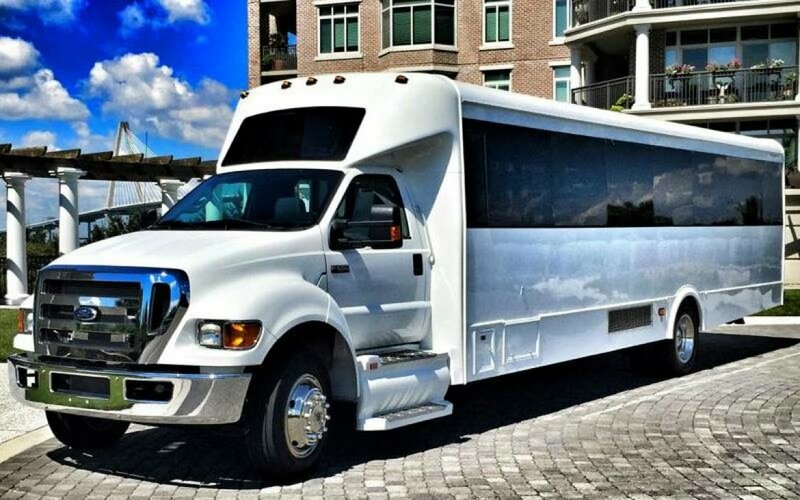 Suppose you wanted to rent the party bus for 5 hours, the most expensive option is $360/hour, or $14.40 per hour per person. For the whole night, it’s only $72 per person. A small price to pay to live the VIP life! 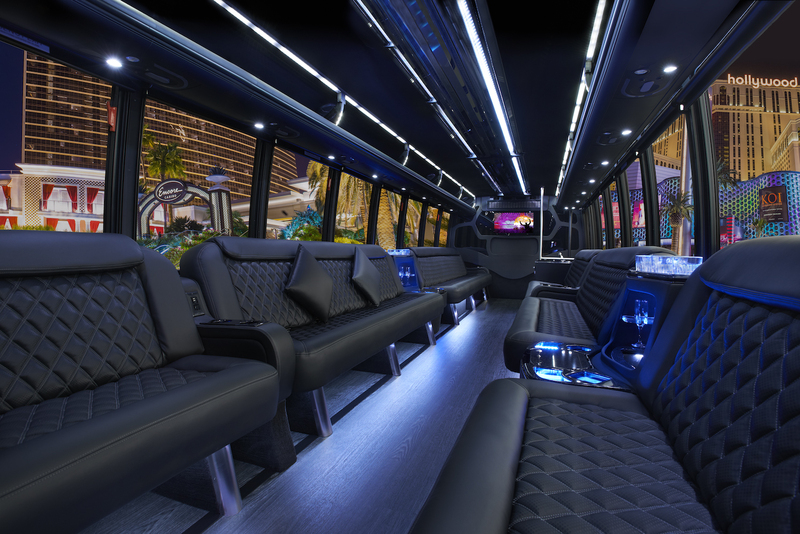 Party Bus and Limo Transportation are priced two ways in Las Vegas. The most common quote is hourly. Meaning the bus is yours to go wherever you want for the duration of the agreement. They will wait outside if you’re in a club, gambling, watching a show, or shopping. The second and more affordable price structure is based on one-way transportation. You’ll be picked up and your start location and dropped off at your destination. This is called a Pick & Drop. After you’re dropped off, the vehicle proceeds to the next booking. Meaning if you schedule two Pick & Drops, you will not be able to leave anything on the bus between your bookings. If you book hourly, the vehicle is yours exclusively and you can leave your drinks, jacket, or other belongings on the bus if you wish. We have rates listed for many of our vehicles below. The price at the top is the hourly rate, and the Pick & Drop rate is listed below. If you have any questions about how to structure your trip, just give us a call and we can tailor the itinerary to meet your needs and budget. Our packages all have gratuity included in the pricing. If you feel your driver exceeded expectations and would like to give them an additional tip. that’s always appreciated but never required. Our team will always appreciate a little extra love! Keep in mind our competitors don’t include gratuity in their pricing and the industry standard is 20%, which will be tacked on to your bill. You’re buying a service, so be very wary of low-cost operators, there’s a reason why they are so cheap! What Other Fees Should I Expect to Pay? Our rates and packages have all the costs included in the price. Our competitors will charge you a fuel surcharge, which can vary wildly. There’s also a Nevada excise tax fee. Airport pickups and drop-offs require a $30 Department of Aviation fee. If you see any fees beyond that, you’re being ripped off! 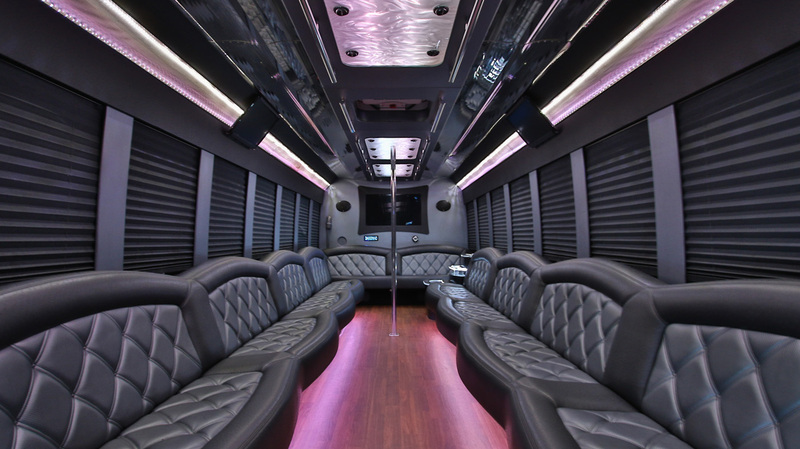 How Much Does it Cost to Rent a Party Bus from Los Angeles to Las Vegas? 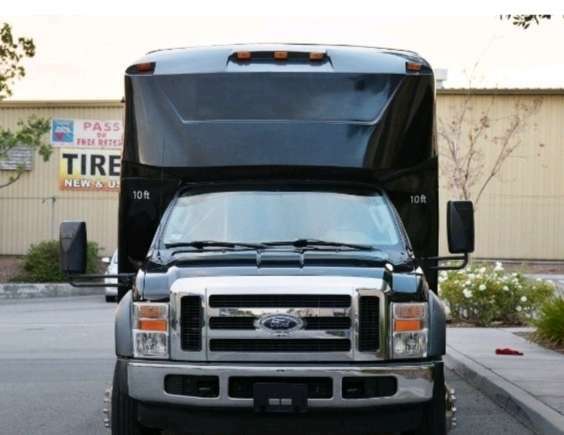 You can easily figure out how much it costs to get a round-trip party bus to your city by looking up the travel time on Google maps and then multiply that time by 2.5. Why two and a half? We have to drive to LA to pick you up, that’s one, then back to Las Vegas, that’s 2 times. Then we have to do that there and back one more time for the last part of the trip. We discount the dead rides (where nobody is on the bus) to cover our fuel costs and to keep the price reasonable. So LA to Vegas is 4 to 4.5 hours depending on your pickup location, so we’ll use 4.5 to be safe. 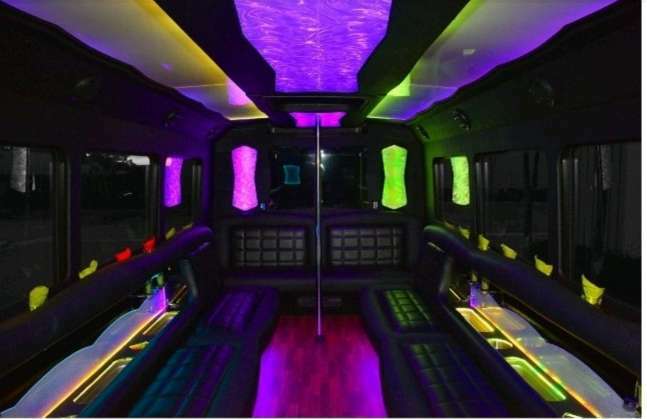 That means you can get our top of the line party bus for only $4050 bucks. That seats 40 people so it’s potentially about $100 per person! To get a custom quote just give us a call! Many of these are pretty obvious. You have a large group and you need to get them someplace at the same time. Most are special occasions which require going the extra mile to make sure the event is memorable. Kicking the event off in a lavish 40 person party bus will definitely set the right tone! Party all the way from LA to Las Vegas.. and back! Whatever the occasion, we want you to enjoy the journey and arrive in style. 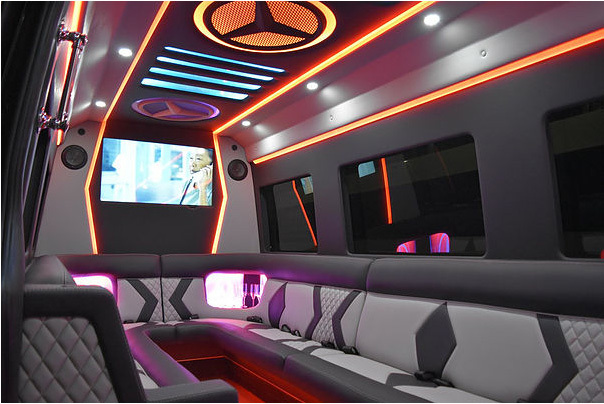 Give us a call and we can help you select the perfect party bus or mega limo for your group. 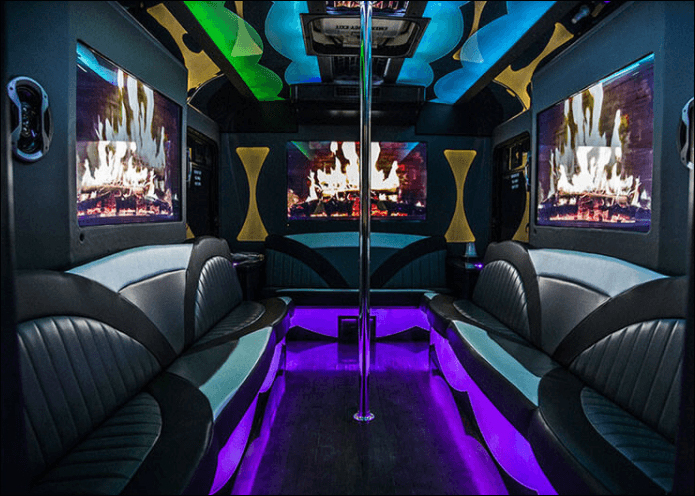 If you’ve never rented a party bus before, there are a few considerations that will help you make the correct choice. While capacities are listed for each vehicle, it’s best to have some extra room based on your needs. If you’re just going from your hotel on the strip to dinner somewhere nearby, you can definitely go up to capacity as it will be a short trip. However, if you’re planning a multi-hour outing we’d recommend having one spare seat for every two people. So if you’re renting a 40 passenger party bus, keep the group below 27 people. This will give everyone room to move around, relax, dance a little, and enjoy themselves! 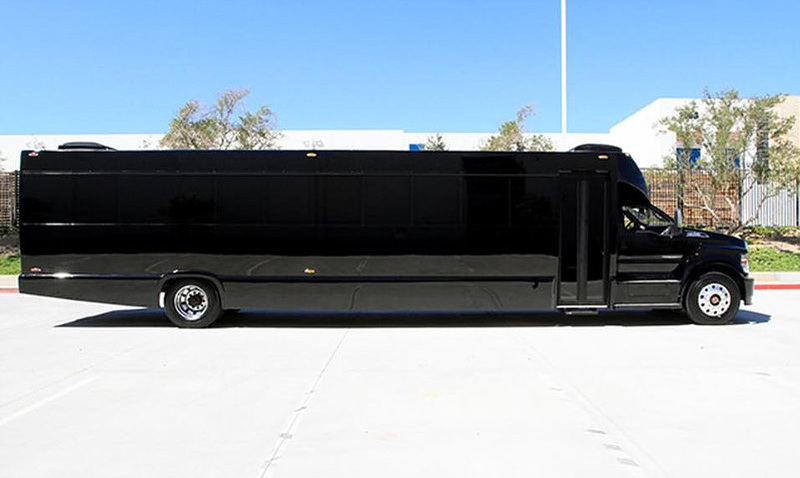 If you’re balling out and renting a party bus for a road trip from LA to Las Vegas, we’d recommend 1 spare seat for each person. So for twenty people, plan on reserving a 40 person rig. You also need to factor in how long you plan to spend on the bus. 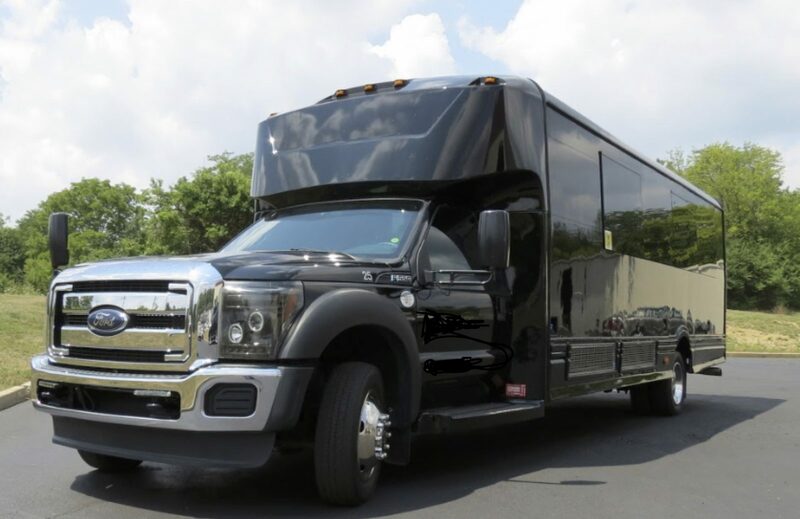 If you’re club hopping, no big deal, but if you’re going to spending significant time on the bus, consider renting DUECES, which has onboard restroom facilities! Does your party have significant luggage requirements? Pay special attention to the luggage capacity of each vehicle. Do you plan to have a lavish rowdy party? Consider busses with 1 or even 2 dancer poles. You never know who may want to channel their inner stripper! 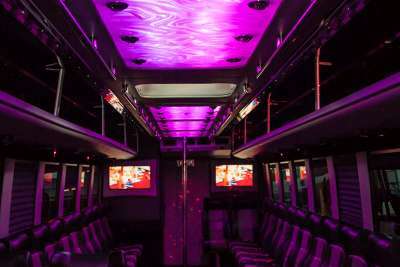 If you have a more buttoned-up corporate event, ask to have the poles removed, or book a party bus with no poles included. 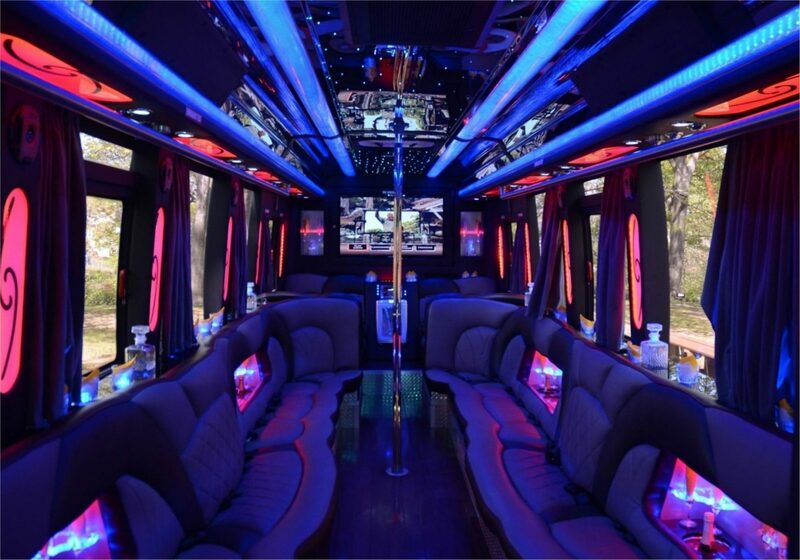 Still not sure which party bus is right for you? Give us a call, and our experts will help you select the perfect vehicle for your needs and budget. What Happens if I Puke in the Limo or Something Gets Broken? Can We Leave Our Stuff on the Bus? Can We Smoke or Vape on the Bus? Can We Just Drive Around and See the Sights? It really depends on the needs of your group and the time of year. 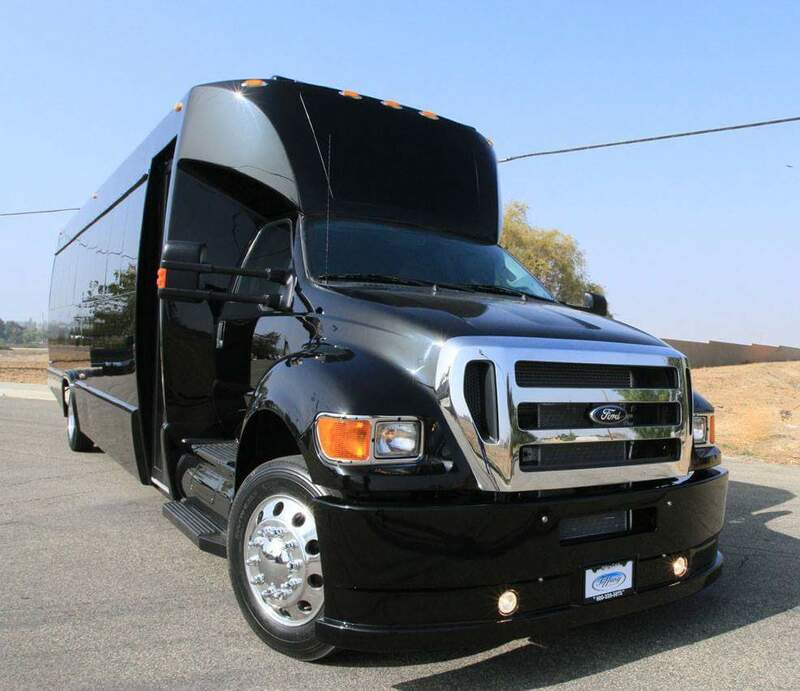 If it’s peak bachelor party season and you need a large party bus, try to book out in advance. If you have a smaller group and just need a couple of pick & drops, we can usually accommodate same day or next day bookings. Best advice, just call. Let our experts work the details and get you hooked up! Your group deserves to have a good time, but there are a few things you need to know in case things get out of hand. If you break a TV or smash the glassware, there will be a fine incurred. If someone pukes on the bus, there’s a $500 clean up fee. Why? Well, first of all, vomit is a biohazard, so the affected area needs to be thoroughly cleaned. This takes time, which may put the vehicle out of commission for the next booking on the schedule. So keep an eye out. If you see someone looking a little green in the face or too deep in their cups, just let the driver know. We can call a rideshare car and get them back to their hotel safely. It’s much cheaper than paying the cleanup fee. If you have any questions, please ask your driver, they will be happy to help you. But in general, treat the vehicle with respect, and you’ll be fine. Most groups schedule a quick liquor store stop to purchase all of their liquor & beer at the beginning of the trip. This ensures you get exactly what you want to drink and also helps keep the rates low. For hourly bookings, you may leave your belongings on the bus, but we recommend keeping valuables such as jewelry and cash on your person. If you booked a pick & drop, you’ll need to take everything with you, as the vehicle will proceed to the next booking after dropping you off at your destination. 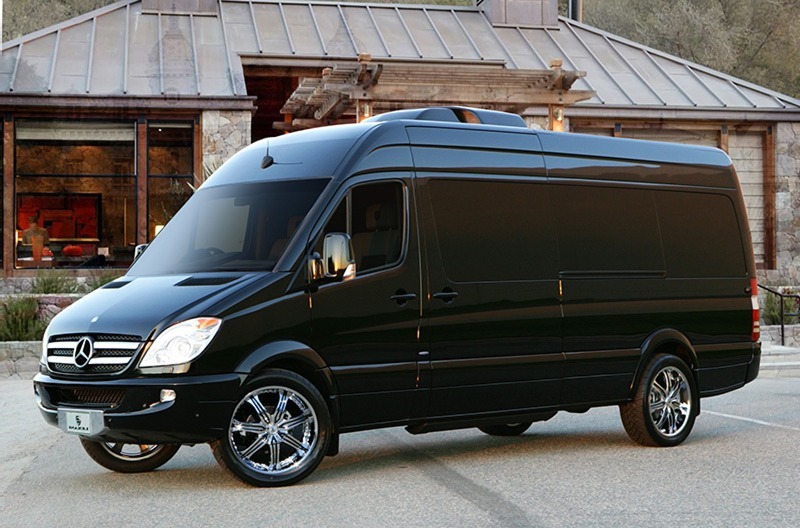 The hourly rate clock starts when the vehicle arrives at your pick up location. Please be ready to depart at that time. It does not start on departure, so keep that in mind and have everyone ready to go. We offer a no hassle 100% money back guarantee up to 7 days before your booking. We do need to block out time for your ride, so that vehicle is unavailable for sale to other inquiries. For hourly bookings, you can go wherever you wish and enjoy. For a pick and drop, it is point-to-point transportation. ADDITIONAL QUESTIONS? LET US KNOW! Just to prove you are a human, please solve the equation: 23 + 14 = ?